Mimosa. My husband wanted to name her after a drink since she when we adopted her, the shelter referred to her as a “drunk sailor.” Lucky for her I vetoed the name “tequila” and chose Mimosa instead. How severe is her CH? Mimosa has a mild form of CH. When we originally adopted her she seemed to be a bit worse, but as she has gotten older she has become much more agile, adept and capable of getting around. Like any CH cat, she struggles with balance issues. When we first adopted her she was very unsteady on her feet and her body always seemed to take her into a different direction than she wanted. Now she can jump onto low surfaces, walk up and down (carpeted) stairs and keep steady (for the most part). Mimosa manages the litter box quite well now. We did have to get her one with high sides so she didn’t fall out at first and now because she’s a litter-kicker. She is pretty steady while she is in the box but she always seems to “fall” out instead of climb out of it. As far as eating and drinking she leaves quite the mess! She used to bob her head so much it was hard for her to eat and drink much at one time but now she does not do that at all. She still however feels the need to take large mouthfuls of food into her tiny mouth at once and when she tries to chew them they all come tumbling out ALL over the floor. She sure doesn’t overeat because I spend most of the time cleaning cat food off the floor! What’s one funny story about her (related to CH)? There is not enough space to talk about all the funny stories with Mimosa. I think what gets us every time is what she is capable of getting into, regardless of her limitations. Even though she can’t jump very high at all, she refuses to let that stop her from reaching her goals. She has mastered the art of climbing, much to the dismay and ruin of my furniture, and every time I turn around she has managed to climb onto some crazy spot and has gotten into something she’s not supposed to. We haven’t had any serious accidents but I am constantly worried that she will. She LOVES to play all the time and when she gets really excited she likes to run around and has a habit of ramming into things, such as walls, chairs etc. She has really improved at running but still lacks the ability to “stop.” She’s definitely hit her head a few times harder than I would like, however, she always just shakes it off like a champ and goes right back to attacking her toy! I think Mimosa’s personality is what sets her apart from other cats I’ve ever met. Even my mother, who had many cats growing, up can’t get over what a unique personality she has. 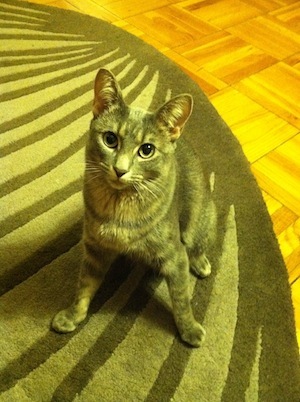 Mimosa is loving, energetic, friendly, talkative and fearless. She doesn’t like to be left out of anything and always has an opinion on whatever anyone is saying. She also thinks she is human and has a habit of mimicking what she sees. 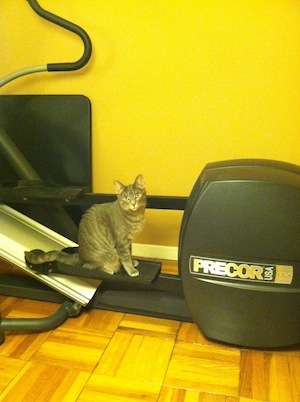 If I get on the elliptical, when I get off, she climbs onto it. If I get up off a chair after doing work at a table, she goes and sits over on it and climbs onto the table to see what I was working on. If I am using a highlighter for work, she HAS to have it and if I am drinking out of a glass she wants to drink out of it too. She constantly wants to be around people and sit on your lap but she also is very independent. She doesn’t let CH hold her back and she likes to do things on her own. If Mimosa wants to do things a CH cat normally would or could not do, she will attempt and conquer them on her own terms and she doesn’t want your help doing it! We have tried to “cat proof” the apartment so to speak. For example, we try to move things away from the areas where we know she plays or jumps off of things, particularly things with sharp edges, so she won’t hurt herself when she does so. We also try to let her learn to do things on her own. The more she learns to do it on the own the less dependent she becomes on us and the more familiar she gets with things. Keep a close eye on them but give them enough space for room to grow and improve. Attempt to interact and play with them as much as possible. We try to keep Mimosa moving and help her acclimate to new environments so she can master new things. This may not be possible for all CH parents but for those with mild CH cats, it can help a lot. We have noticed a remarkable improvement in her functioning and motor skills over the past few months. 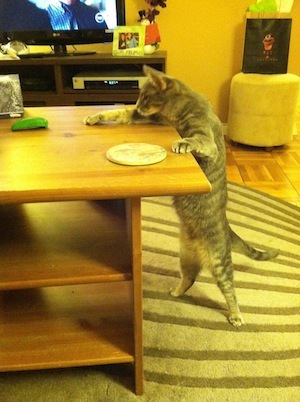 Beside their “wobbly” nature, they are really no different than “normal” cats. I think most don’t even know they are any different. It may be a challenge to “keep up” with a CH cat sometimes but their personalities and the general care required is not much different than taking care of any other cat. My favorite and least favorite things about Mimosa having CH are probably very similar. What I love about Mimosa so much, in addition to her spirit and determination, is her wobbly, off-balance nature. Her “prance” or “supermodel” walk, as my friends like to call it, make us all smile and laugh every time we see it. However, her balance issues also make for lots of banging, crashing, and falling. While I find her wobbly-ness adorable, it also is a constant source of worry that she is going to hurt herself. 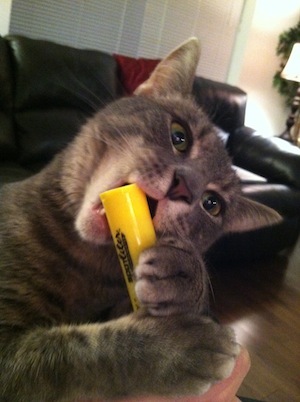 You can also find Mimosa on Catster. ← New to Feline Cerebellar Hypoplasia? Start Here. Mimosa sounds like she has quite a personality! I can relate to your comment that having had many cats, CH cats are really special. I know I am closer and more involved with Dotty than I have ever been with any of my other cats, no matter how much I loved them. Thanks for sharing your story.